I have been terrible at keeping up with my video posting schedule lately, hence this blog post and video are about 2 weeks late. Nonetheless, I’m excited to share! The video has been recently posted to the Spellbinders Youtube Channel and that means I can share this card and video on my blog. So here it is! I wanted to create a card using a stunning Oval Regalia S4-492 die and I have to admit – I am so so happy I got to work with this particular set! The largest oval is simply stunning, it reminds me of a fancy doily. Very beautiful indeed. I created three flowers using the Bitty Blossoms set and used those to embellish my card. These are very easy and fun to make, you can even make them out of fabric, and I think I’ve shared a card like that on my blog too, here’s a link. To add a bit of detail to this project I also used the Gold Ovals set and debossed beautiful texture onto the inside oval. The Gold line of dies is amazing, I haven’t been using those much lately, but they are one of the best to add details to simple shapes like ovals, circles, rectangles and squares. You can see a bit of dimension on the photo above – I used foam adhesive to attach the label and the oval. I also added a few white pearls and a bit of twine to this project. I would appreciate you clicking the thumbs up and sharing this video if you like it. Thanks! 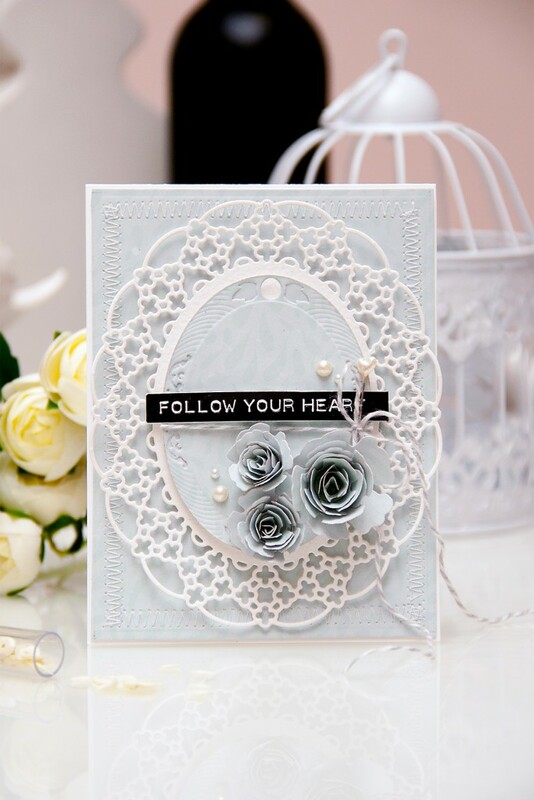 I’m crazy about your creations because you don’t go overboard with the embellishments…the beauty and details of the paper just shine through, making it a feast for the eyes! 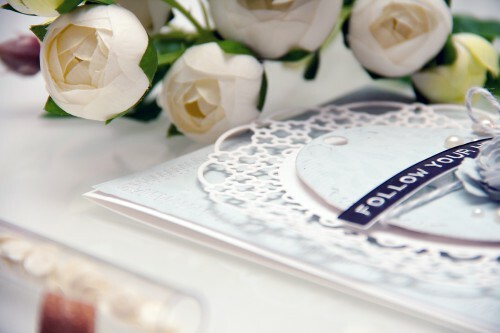 I think small cards should have less adornments…Thank you for letting us enjoy beautiful things in life! thank you so much, Emily! 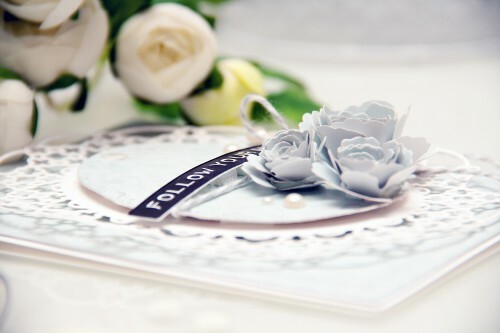 To tell the truth – I don’t even own that many embellishments, only a couple of yards of ribbons, some stick pins and maybe some wood veneer shapes (which I mostly use for my Clean and Simple stamped cards). I was never a pre-made flower type of cardmaker, so I don’t have those either. 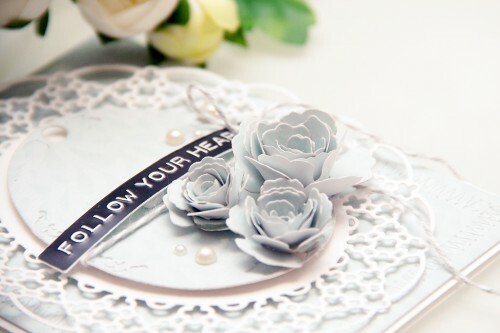 I always try to make my own embellishments using whatever I have, usually dies, lol! Thank you so much! 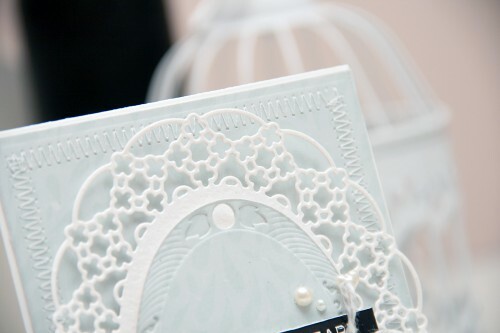 Could you please give us an idea how to create a romantic, filigree and lacy effect table calendar? I’m surprised that you’re not the typical overly stocked artist..perhaps that’s the blessing and the secret of your beautiful creations! Carry on!